Sandstone has a bouldering and toothbrush ban in place to help reduce the issue of holds being worn away by repetitive and abrasive brushing. Repetitive brushing with harsh brushes will wear away the outer layer of sandstone, revealing even more sand underneath, therefore making it even harder to climb! 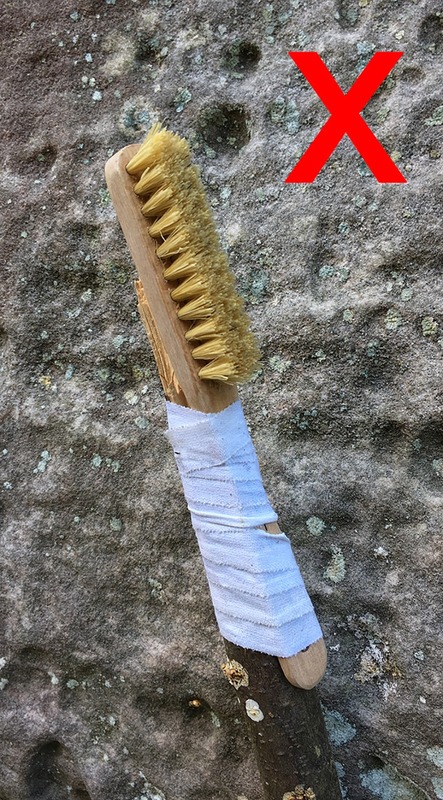 So if you want to climb better and also help preserve the rock, then don't use harsh boulder brushes. The only form of brushing permitted is that to remove general debris and loose sand. This is best done by using an extra long very soft bristle hand brush, such as those used to clean cars. Flicking holds with an old towel or rag is another option. The build-up of chalk is a problem so we ask boulderers to use more eco-friendly alternatives such as Eco Balls to help elevate the issue of chalk build-up and the need for cleaning. When out on sandstone it is almost inevitable that toothbrushes will come with you and will most probably be attached to your chalk bag. We all fall victim to this and it's certainly not the end of the world. 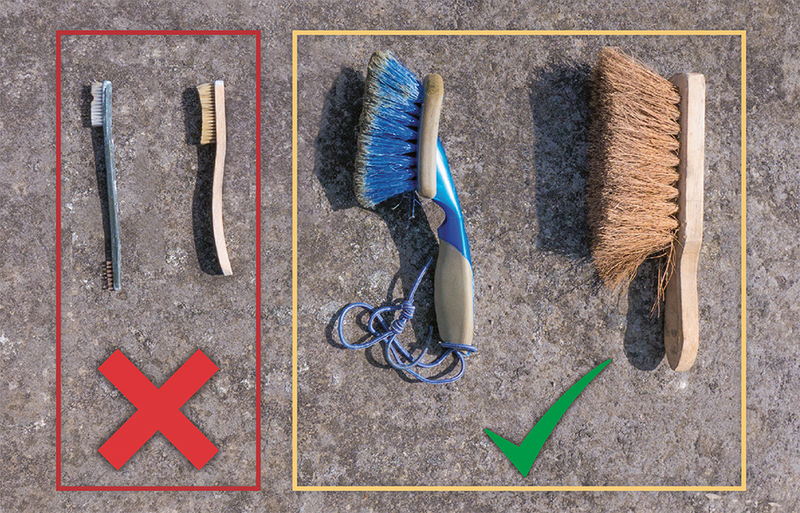 If you remember, it's best to place it back in your bag and out of sight, as undoubtedly you may get the small brush ban pointed out to you by passers-by. One item that cannot be mistakenly brought with you is a bouldering brush extension pole. This item is too large to accidentally come with you and will most probably identify intentions of using it to clean the sandstone, in an inappropriate and damaging manner. 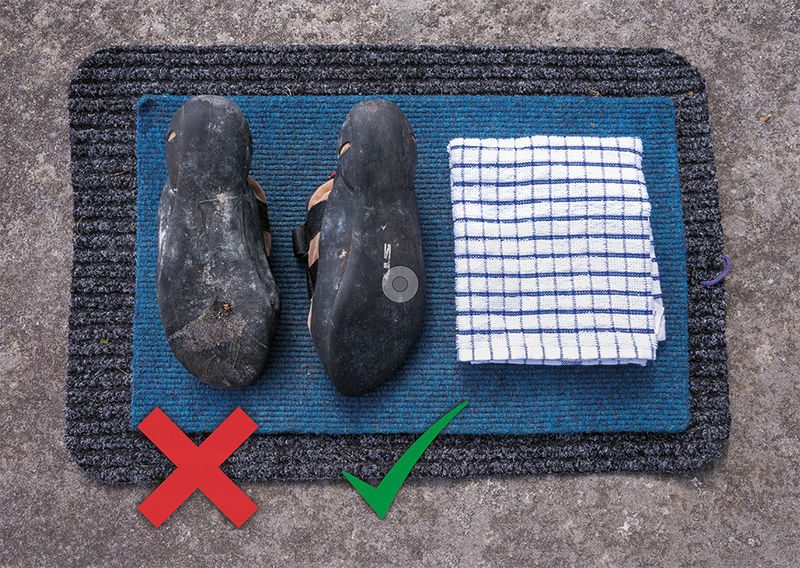 In addition, make sure you clean your climbing shoes before getting on the rock. If you don't you will just fail! Loose sand on your shoes makes you lose your grip and slip, and in addition,, this can have an impact on the rock and wear away the rock. Do spread the word and help keep sandstone around for all of us to enjoy for years to come!